Right before Christmas I received my latest order from PaperTrey Ink. I am so glad I included this snowman die set in my order. Our little grandson Caleb has been enjoying using a felt board to make stories. I used this set to add to his collection of felt shapes to use in his stories. When I gave him his snowman pieces he made 2 and placed them by Santa's plate of cookies! I am finding more and more how much I love using dies. Santa even brought me The Tim Holtz Vagabond this year and I can't wait to start using it! Just for fun, I am linking this to a challenge I just heard about (thank you Lisa Kind!!) over at Just Us Girls. Be sure to take a look at their site. SUPER FUN challenge site! I am looking forward to celebrating a brand new year starting tomorrow -so let's do it together - right here. See you then. This is adorable. Just Us Girls is having a felt challenge...a perfect fit for this. I stumbled upon your blog and I'm so glad I did! Fabulous work and totally my style! And I think I remember seeing you on Coast to Coast! Thanks for sharing your work! What a stroke of luck, to have you connect with Lisa: and NOW we can see your beautiful work! If there is such a way as a "perfect" way to use felt, you have found it! THESE GUYS are outrageous: so MUCH fun! Thanks, ever so much, for sharing your wonderful creative talent with Just Us Girls! Hey Susie, these guys are so cute! Happy New Year! Very cute and what a great idea for the kids. Your card is adorable. What a great present from Santa! 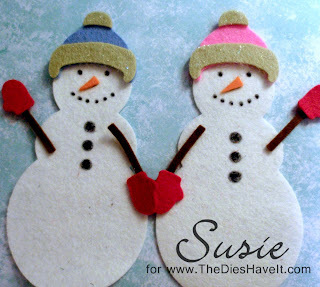 These snowmen are beyond adorable! I'm sure your grandson loved them. Thanks so much for playing along with Just Us Girls! Cute cute cute cute cute! Love your snowmen. Thanks so much for joining JUGS this week. IT's great to have you on board this week. :-) Happy New Year! Snow cute!! Congrats on your win over at JUGS!! Super cute! I love this idea! THese snowmen are going to be a favorite on your grandson's story board. Congrats on being our Chic of the week!